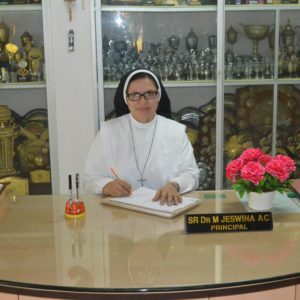 The Principal, Sr Dr M. Jeswina A.C.
A sprawling campus with the state of the art facilities including women’s hostel, it is well located in the heart of the city and offers Undergraduate and Post Graduates Progammes that are holistic where academic excellence runs parallel to emotional, social and spiritual formation. It is not only the first women’s college to be established in South India but also the first in the nation to be founded and managed by an Indian private management. Drawing inspiration from its Motto “God is our Strength”, St Agnes has laid emphasis on building a just society through various academic pursuits, including research activities, community awareness and developmental programmes. The college is on the threshold of its Centennial Year in 2020 and a host of activities and celebrations are being thoughtfully planned. Over the last 99 years the college has educated and enlightened many students who have made a positive impact on the society in far flung nations of the world. The college has a vibrant and supportive Alumni Association with branches in India and different parts of the globe. I wish and pray that all those who enter the portals of St Agnes College may experience it as “A Home of Faith, A Home of Fellowship and A Home of Fruitful Study” just as its Foundress, Mother Mary Aloysia aspired. May God’s blessings of love, joy and peace, reign in the hearts of all our students, parents, alumni, benefactors, friends, well wishers and everyone who is associated with St Agnes College. God bless us all.